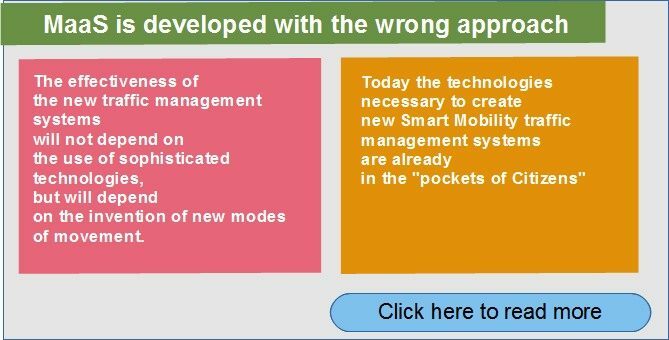 Today we try to develop an innovation of Urban Mobility (and to create Mobility as a Service) with a wrong approach. The fact is that when one intervenes on a system in critical conditions, to create valid and lasting solutions, it is always necessary to start from the foundations of the context that must be improved. Otherwise it is built a system that is not at all innovative. And it is therefore destined to fail in the medium to long term. Today in the “initiatives” related to Mobility (such as those based on Mobility as a Service) we talk about Services using a “partisan”, obsolete concept: for Services they mean Public services. 1. The Service has a wider meaning than that of Public Services, which also includes that of private services (totally independent from public administrations) that can be complementary to public services (and can even replace them). As it is for Uber, Airbnb, Bla Bla Car. A REDEFINITION OF THE PARADIGM OF URBAN MOBILITY. Basically, a redefinition of the essence of the Mobility Concept is necessary, upstream of the definition of specific elements (of software and hardware technologies). 1) redefinition of the METHOD OF USE (OF THE MODE OF POSSESSION) OF THE MEANS OF TRANSPORTATION. (of the management from the Public Administration). In this regard, see the Personal sharing solution proposed by the project LiteMotive. 2) redefinition OF VEHICLES FOR “PRIVATE” MOBILITY: a redefinition of the primary object of mobility: the vehicle. As shown in the Post linked below, there will be a fork in the Automotive sector due to the fact that really efficient vehicles for urban traffic can not be “cars” in the current sense of the term (today the so-called City Car, as far as shrunken, they are electrified cars, that is, they are vehicles that still maintain the negative qualities of current traffic). So in the cities will soon be used City Vehicle of new generation (this will be possible thanks to the application of the principles of disruptive innovation, as a revision of the tax rules related to the car). In this context it is important to define methods of “compatibilization” of traditional cars (one of the critical points solved by the LiteMotive project). on the invention of new modes of movement. This is possible thanks to the fact that current low-cost technolgies are able to provide more than enough performance to meet the complex needs of the mobility. (ex: SmartPhone, computer and car black). Regarding traffic management systems, there will be the quantum leap of the disruptive innovation, for example, with the transition to the use of Peer 2 Peer systems (ie systems based on the Blockchain concept, which allow to do without a institution that “governs” the system). In the new context of Urban Mobility the current system of vehicles and infrastructures managed by the Public Administration it assumes a secondary role (it will be gradually joined – and substituted in many of its aspects – by increasingly effective bottom-up structures). In anticipation of this, the public transport system must be drastically revolutionized. Otherwise it will go against a bankruptcy. – integration with the new modes of movement, such as the one defined as multimodal. – integration with the new methods of bottom-up organization (Peer2Peer) of Mobility (Crow Generated Mobility System). (this is not an ideological choice, but if we want, a choice of “convenience”: Public administrations have advantages in radically transforming the city’s public transport system from an economic point of view – the deficit of transport companies is becoming unsustainable – both from that of popular consent). For these reasons it is therefore necessary to redefine, from the roots, the public transport system (redefine the paradigm). It is important to understand that in the new dimension defined by emerging trends, things are no longer granted up-down, but are defined by the citizens in direct mode (with new mobility systems directly managed by the Crowd that will be developed thanks to new Apps) and in participated modality (as it will be, in fact, for the institutional services that will become “Open” to the participation of the Users). Recall that emerging trends are a reality that can not be ignored: they are a bottom-up phenomenon that derives from an inevitable need of Demand. Unfortunately, the innovation initiatives currently underway by the Institutions (and the companies “linked” to them) are destined to remain on paper or at the experimental stage precisely because they, despite having the appearance of real innovation, do not take account of emerging trends (they adopt the keywords of innovation with an altered meaning). Basically, the institutions are currently in a position to paradoxically try to change a system with the elements that have created the problems that you want to solve. BUT THE USER BECOME THE SAME THE OPERATOR. Ultimately, the new Mobility Apps that allow – on paper – to “optimize” current public transport can not improve a system that is substantially incompatible with a real Mobility as a Service. 5) redefinition of DISPLAY MODES (AND HABITS). In the new scenario the methods of movement within the city also change radically. And, more specifically, the interrelations between the Users and those providing the Services radically change (the change is so radical that, in fact, in many cases the Users themselves become operators of urban mobility). In general, the end result of a truly effective innovation is a radical change in the practices, in the habits of the Users. The true aim of innovation is in fact a marked improvement in the quality of life of people. To achieve this result, however, it is necessary to intervene, in a disruptive way, on each of the specific aspects of the context on which it intervenes. The current problem is precisely that the Public Administration seek to innovate Mobility while keeping the majority of the elements of the current Mobility systems unchanged: thus implementing a superficial innovation, which will never exceed the first phase of implementation. This approach is substantially due to the short-sightedness of the operators in question. But also, partly, to the desire to develop a innovation of convenience aimed at satisfying “interests” that do not coincide at all with those of the users of the Mobility system (access to funding, the possibility of paying suppliers with whom they have established “privileged relations” ). ● “private” means of mmobility: there will be a change of the vehicles (after the consequences of the fork in the sector Automotive described above). And the methods of use (the mode of possession) of the vehicle will change. ● Mobility Plans: will be radically different from the current ones, both for their contents and the modalities with which they will be defined. – the mobility rules will be defined with the participation of citizens (even those who do not use mobility systems): in this way the systems will be more responsive to the needs of “the City” (Mobility will be really subordinated to the other needs of the City) . – the new system of mobility rules will make it possible to approach the condition of “City without cars”, and will therefore determine a new way of experiencing urban spaces. – at Crowd, the Users will (mostly) organize themselves for their movements in the City. – at new forms of social entrepreneurship. Consequently, in such a radically innovated scenario, will change the modes of movement within the city; and “urban practices” in general. ● will change the interrelations between citizens and the institutional transport system (of the Public Administration). The institutional systems will go towards an “open” dimension, of “participation” of the Citizens in the management of the same. ● will change the interrelation between citizens. First of all it is necessary to understand that not only the interrelations between the User of the Mobility system will change: also the interrelation modalities will change among all the Citizens (even those who do not use Mobility systems). In a new era characterized by factors such as sustainability, sharing and caring economy, an effective innovation of a specific context of urban life can only be the result of a disruptive innovation of the whole System-City. In this context of innovation, to define the rules of “traffic” will also have a say in the Citizens who do not use the Mobility System. The latter will participate in the definition of new sustainable mobility plans. Recall that, thanks to the radical innovation of Mobility, even if in this context it is subordinated to other needs of the City (to a more general quality of life), urban routes will in any case be more efficient.